Introduced in 2010, the DOXA SUB 800 Ti Professional is a high performance dive watch designed to explore the depths of ocean. Dressed in a solid yet light weight and scratch resistant titanium case, this timepiece offers high legibility even during dark conditions, thanks to the unique technology employed in its highly luminous hour markers and hands. The Swiss Made movement ETA 2824 ticks inside this timepiece. The orange dial (also available in black) with luminescent hour markers and hands boast a date indication at 3’o clock. This timepiece incorporates a unidirectional rotating bezel with decompression table in feet. The Screw down case back is engraved with serial number of the timepiece. 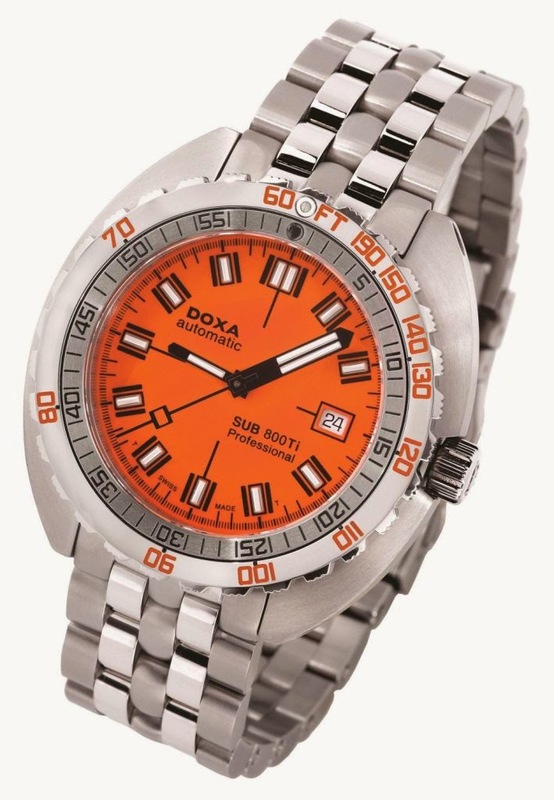 The DOXA SUB 800 Ti Professional offers water resistance up to 800 meters. This timepiece is supplied with a titanium bracelet with wet suit extension system.